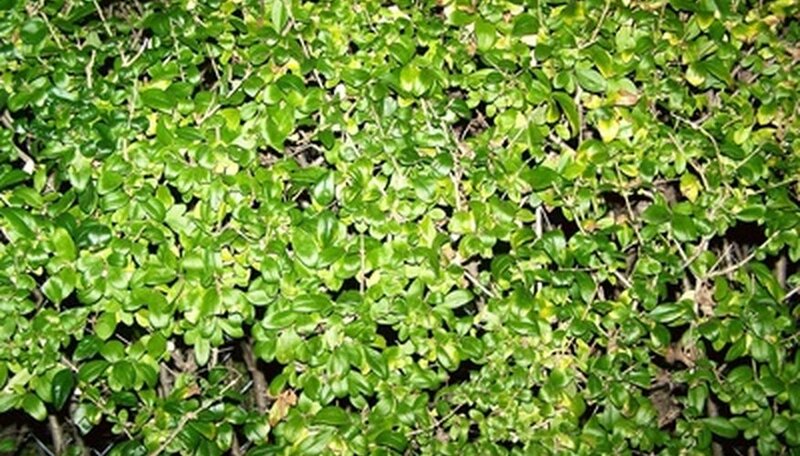 The most common ligustrum shrubs are the Japanese or wax privet (Ligustrum japonicum), glossy privet (L. iucidum) and the Chinese privet (L. sinense). The Japanese and glossy privets have thick, glossy leaves that grow to 4 inches in length. The glossy privet and the Chinese privet are invasive, as they seed themselves. Left unpruned, the glossy privet can grow up to 40 feet in height. The privet is commonly used in landscape because of its rapid growth and its ability to adapt to most soil types. Propagate the privet via hardwood cuttings, if not allowed to seed, by taking a cutting that is at least 4 inches long from a dormant, mature stem from November through March. Avoid cuttings with buds. Remove the buds if you have to use a cutting that has them. Work the cutting immediately or place the cutting in a dark plastic bag with wet paper towels. Keep the cutting moist. Keep cuttings in dark plastic and paper towels in the refrigerator if they have to be stored. Remove the leaves from the bottom half of the cutting. Cut the leaves in half to help with water loss if the leaves on the top half are large. Cutting the larger leaves in half also helps species that are difficult to root. Dip the cutting in rooting medium (available at any nursery or big box garden store). Stick the cutting at least 2 inches into the moistened potting soil. Put at least four stakes into the flowerpot. Drape plastic wrap over the stakes to hold humidity in the planting container and help the plant retain moisture. Place the pot with the cutting in indirect sunlight. Mist the cuttings on a daily basis. Most potting soils are well-drained, but if you make your own, mix 1 part peat moss and 1 part sand.